Last November voters overwhelmingly approved Initiative 1433 to increase the minimum wage and establish a statewide standard for paid sick days. Initiative 1433 raised the minimum wage to $11 an hour on Jan. 1, 2017. That was an increase of $1.53 from what it was on Dec. 31, 2016. That’s a 16 percent raise. It is relevant to ask: What was the impact of this increase on jobs? After all, economists predict, using simple theoretical modeling, that an increase in the minimum wage will result in a decrease in jobs. That 16 precent increase in the minimum wage does not seem to have made much of a dent in jobs. In fact, jobs increased between 2016 and 2017. Employment grew by more than 100,000 jobs statewide. Employment in Snohomish County grew by 16,000 jobs. The unemployment rate fell from 4.9 percent to 4.2 percent. How about in occupations in which minimum wage workers are clustered, like retail jobs? In retail, jobs grew by almost 16,000 jobs between January 2016 and January 2017. There were 1,000 more jobs in retail in January 2017 than in December 2016 — that is just in one month, after the Christmas holidays. Restaurant and bars employed 9,000 more workers in January 2017 than the previous January. I thought I would ask a restaurant owner (rather than an economist) to explain this data. She told me that she was switching to a $15 minimum wage in April. Instead of tips, they will have a service charge. This will enable her to spread wage increases to back of the house workers, and keep the wait staff as well. Workers stay in jobs that pay better. They are more invested in their work. They do better jobs. Customers are more satisfied. Employers spend less money for recruitment and advertising for workers and training them. It is a business model that works. Moreover, it puts more money in the pockets of minimum-wage workers, who are apt to spend that in the local economy, stimulating sales, and, of course, more sales jobs! Therefore, it should be no surprise that increases in the minimum wage result in job increases. It is a matter of actual human behavior in the private market, not an imaginary economic model. There are about a half-million workers in our state who directly benefit from the increase in the minimum wage, and another 250,000 who will see their wages nudged up some as the minimum-wage floor rises. Two thirds of these workers are older than 25. Almost 4 out of 5 have no college degree. Three out of 4 live in households with less than $60,000 in annual income. Do we want to enable them to earn their way up the income ladder? Of course. An increase in the minimum wage provides one of the first rungs of that ladder. I got a comment after I editorialized about the minimum wage last January. This reader wrote, “How about a Social Security raise?” Right now Social Security does not provide enough income to live on. He and his spouse are pushed to the limit. 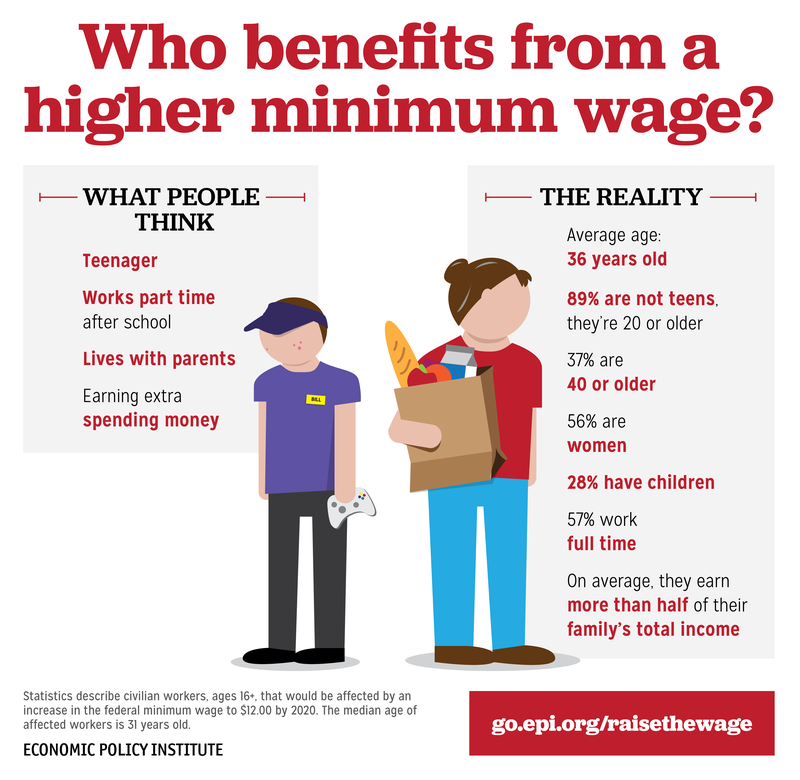 So why work on minimum wage? I agree: The federal government should increase Social Security benefits. But here is the thing, my friend, Chuck: The increase in the minimum wage will result in additional contributions to Social Security through the FICA tax of $200 million a year from workers in Washington state (and another $50 million will go into Medicare). So if a politician asks you how to pay for an increase in Social Security, just point to increasing the minimum wage. We are all linked together. It makes a lot more sense to strive for the high road than to push workers down, and pull ourselves down with them, into poverty. The voters in Washington understood that in passing the minimum wage increase.